We've been absolutely spoiled with sparkly splendor this week, everybody! Enjoy, and be sure to vote for your favorites in the poll! 10. Crown Princess Victoria and Prince Daniel of Sweden have been in South America this week. On Monday in Lima, she wore a lovely dragonfly brooch. 9. Back in Sweden on Sunday, Queen Silvia wore a golden brooch for a meeting with President Rousseff of Brazil. 8. Queen Margrethe and Prince Henrik of Denmark are currently on a state visit to Indonesia. Margrethe wore a gold brooch and earrings for their arrival on Wednesday. 7. On Thursday, Margrethe wore an intriguing combination of jewels: a small brooch set with diamonds and rubies, earrings with red drops, and a pearl necklace. 6. At the welcome ceremony for the President and First Lady of China on Tuesday, the Duchess of Cornwall wore a familiar pearl choker necklace and pearl earrings with her pair of diamond clover brooches. 5. Queen Letizia of Spain selected her di Grisogono black diamond earrings for Thursday's Princess of Asturias Awards event. 4. Queen Elizabeth II wore her diamond and ruby spray brooch at the welcome ceremony for the Chinese presidential party on Tuesday. 3. The Queen debuted a new brooch at Thursday's farewell ceremony for the Chinese President and First Lady: a golden brooch set with three emeralds from the collection of the late Queen Mother. 1. 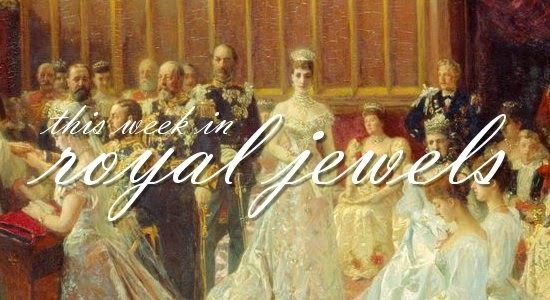 The Windsor women get my collective top vote this week for their bejeweled showing at the Chinese state banquet. You can view more about all of their jewels in our post here!